For the last 5-10 years gardening with raised beds has seemingly been the most popular method of backyard gardening. It has been purported to solve many ‘normal’ problems people have from dealing with weeds, getting a better quality soil, and being easier on your back since your vegetables are now 6-8” above the ground. I have to admit that they are aesthetically attractive in all the ‘pintrest’ and ‘instagram’ images I see. Now, if you fell in love with some pictures on pintrest, and have your heart set on recreating what you saw – then do it. You need to make yourself happy and love your garden. If you are already ‘converted and committed’ to raised beds,then you should do what your heart tells you. Furthermore, if you have mobility problems, or can’t garden on the ground without pain or something else, then I’m sure a raised bed is your best option. But if you are unsure, just doing research, or can’t decide on what style of garden you should build then continue reading. I’m going to expand on the following items to consider before running out to buy materials to build raised beds. This article is primarily directed to those who think that because they have ‘poor’ soil, or hard clay, or some variation – then the only way they can have a successful garden is to construct raised beds and bring in soil. So, take a few minutes and read through my reasoning. It might change your mind, or at least may generate some new ideas for you. Nobody tells you the drawbacks or raised beds….. I often see people asking questions on ‘how do I start a garden’ on message boards and Facebook groups. These people asking the question are almost immediately bombarded with 10-20 responses trying to convince them to build raised beds, with no consideration into alternatives, the person’s situation, etc. However, there are a lot drawbacks or logical contradictions that aren’t considered in all of the raised bed propaganda. So now I will list a few reasons why you shouldn’t build a raise bed garden, and some of the flawed reasoning behind raised beds. My goal here is to get you to at least consider in ground gardening, and make you aware that some of the ‘assumptions’ of raised bed gardening aren’t really true. When looking at various pictures of raised beds, the cost of construction is often glossed over, or certain local perks (like free garden soil from your city) are assumed to be a possibility. Building raised beds can be quite costly. Let’s break down the cost of building four 4’x8’ raised beds that are approximately 15″-16” inches tall. Doing this would require approximately 160 cubic feet of soil, or approximately 6 cubic yards. Now, the pine should last several years depending on your location and how wet the underlying soil is. How long do they really last? Well, I’ve found testimonials from people saying they lasted for 10+ years to as little as 2 years. So what happens in when they rot? You have to replace them. Simple as that. Hopefully the corner posts are still strong (but maybe not), and you may just consider replacing all. This is a piece of maintenance that in-ground gardeners don’t have to worry about. If you use cedar, your costs will increase significantly. The rot resistance is much higher too for Cedar. However the nominal thickness for cedar boards is only ½ the thickness of regular construction grade pine – so the strength is not as much. You may find that you need to keep beds shorter or have additional side wall support to hold all of the soil. How much does the soil cost? For the four 4×8’ raised beds we costed out above, the total volume of soil you would need is 160 cubic feet (6 yards) if you filled it to 15″ deep. You could buy this in bulk from a local supplier, or purchase it by the bag from a big box store. Doing so is not cheap. The cost for buying in bulk can range wildly – if you are just going to use top soil and could haul it yourself in a pickup truck, it could be pretty reasonable. If you need it delivered, it will cost more. If you buy premium bagged soil, it could cost more then you paid for lumber! A typical value for topsoil is around $15 per yard, and buying six yards will come to around $90. Also, I haven’t included any compost in this price, as this is already getting very expensive. Hopefully your local city has some you can just pick up. If not, please try to MAKE YOUR OWN COMPOST! Our method breaks it down to show you just how easy it is. A lot of people tend to overcomplicate it, we hope our article helps to make it easy & fun for you to start making your own. So, for a total of four 4’x8’x16″ raised beds, you will spend (depending on your soil and lumber) roughly between $280-$614. I’m excluding screws, and the cost of bagged garden soil, as it is just insanely expensive. Now, these costs will scale perfectly for the sizes I’ve described. If you only wanted to make two raised beds, then just divide the numbers by two. If you only wanted them 1/2 as tall, again you can pretty much divide the cost by 2. The cost of constructing a traditional in-ground garden? Nothing but sweat equity and 1-2 hours of hard work. My method shows what I feel is the easiest and fastest way to CLEAR SOD BY HAND. Check it out, I think you’ll find it helpful. Why do I say only 1-2 hours to remove the grass? Well, 4’x8′ = 32 square feet. Four raised beds of that size comes to 128 square feet. If you watch the youtube video below on removing grass you can see that I cleared 36 square feet in about 20 minutes. 128 square feet is just under 3.5 times as large as 36 square feet, so in as little as an hour to an hour-and-a-half I could be finished. Also, an in-ground garden doesn’t have boards that need to be replaced. If your idea of gardening is to use a rototiller each year, then raised beds would seem to take care of weed problems. People say this because you are basically adding new, sterilized soil that should be free of weed seeds, and compost that was ‘hot composted’ (would kill weed seeds). So, I concede that raised beds will provide you with fewer weeds, at least initially – and going forward if you till it each year. However, if you clear your sod the way I described above, you actually won’t really have any short root weeds. If you had thistle or docks, then they might push through (and could on a raised bed as well). But every garden and flower bed I’ve built using the flat-shovel method seems to be virtually weed free. So, this is equivalent to raised beds for weed control. But you should be aware that just using weed free soil, or anything else doesn’t mean you won’t get weeds. Weed seeds are going to blow in from all over no matter what you do. The only way to combat those (besides pulling them) is to apply a pre-emergent (which I don’t do). Many people think that because they have poor soil in their yard that by using raised beds they can buy high quality garden soil and be better off. Well, if you are not going to amend your soil at all before your first year gardening, then that is correct. But purchasing compost and spreading a 2” layer on top of the garden the year before planting. Or, amending the soil as you plant your vegetables in the spring you can have virtually the same effect. The truth of the matter is that building soil is a multi-year long endeavor. Spending money on compost, or making your own compost and topdressing in the fall, and amending when you plant can get you great yields at a fraction of the cost. After several years of actively working to improve your soil quality you will see results. This was a zone 6 ‘October’ harvest from two habanero plants, and a couple other pepper plants. 1st year garden, clay/rock amended with generous amounts of compost. The money you spend on making beautiful, black, loamy raised bed soil (or just buying it – hey its easy)….you could probably have spent that money on a load of compost and amended a traditional in-ground garden. This would have big benefits for the long term, and allow your plants to utilize more soil. Anyone who does any research on how to start a vegetable garden will quickly discover that tomatoes, peppers, cucumbers, and pretty much every other vegetable like good black loamy soil that is packed with organic matter. So, rather than investing all that time and effort into transforming their soil into something better, they opt to do a raised bed and buy really nice soil. That strategy works great, until you consider that roots of tomatoes and peppers like to go down 3-4’ (as well as out away from the plant) at full maturity. So, if you build 8” or 16” raised beds, your plants will be easy to plant in the garden, but there is a lot of soil just beneath the raised beds that is the same old stuff you wanted to avoid. So your “raised bed benefit” is somewhat negated by the clay that lies just beneath the raised bed. 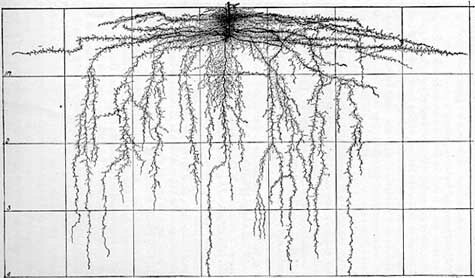 The roots will eventually run right into that poor soil….and stop penetrating any deeper. Also, the roots like to go sideways and spread about a bit, or a lot. Well, if you are planting tomatoes and peppers along the edges of your raised beds then the roots of these will run right into a wall of clay or sand just beyond the raised bed border. Again – raised beds can limit the amount of available soil by preventing root penetration. Clay – Nobody likes, or ‘digs’ it! It will take decades before the area beneath and around the raised bed will get organic matter, etc. And don’t forget – Water water water…..If you have clay, then your raised beds will be like really big pots since the roots will have trouble penetrating beneath the raised beds. So they will need much more water. But how much soil do I need to produce tomatoes? If there are enough nutrients and compost in your raised bed soil, then your yield may not be noticeably effected. Here is the dirty little secret – you can grow most of your vegetables in 5 gallon buckets, and they will produce tons of fruit for you to enjoy. There just needs to be enough nutrients available, sun, and water. But, you will need to water this much more than an in-ground garden. So, you will get plenty of fruit from a container or raised bed – but plants with rooting needs deeper than your raised beds won’t reach their full potential unless the roots can penetrate the soil. Also, the soil beneath your raised beds will only be able to get organic matter from one source – the roots of your veggies that can penetrate beneath, or worms transferring castings, etc. Basically, it will be more difficult. There is no ‘growing’ reason you need to construct a raised bed. When I first started my vegetable garden in our latest home (clay, rocky soil) I dug over-sized holes, and amended with lots of compost. By using a spade, this didn’t take too much effort at all, and the compost was free (yay!). Now, when I go to plant the next year – a shovel full of dirt comes up much, much easier due to the organic matter I added to the ground. But, if I dig in a new spot, it will be that bad soil. That is how much adding a couple scoops of compost matters in regards to transforming bad soil into good, healthy soil. And I will do this every time I plant, to help turn that red clay into black happiness. But why do I think this soil topic matters? I want you to know how you can make bad soil into good, because someday you may want to change the garden layout. My general garden layout has changed a bit each year, as I’m constantly growing new veggies as my tastes change. In fact, this is probably a great time to talk about your garden layout. Another reason to consider more traditional gardening is the layout. Once you build raised beds, you are basically married to them. You cannot change, move, or do significant change without lots of effort. With in-ground gardening, you can change the design/layout of plants each year. The only thing that may prevent this is if you are growing a perennial vegetable like Asparagus. But the garden layout will just be more flexible for you. This next topic mainly applies to dry areas, but it is still very important. If you built a raised bed because you had poor soil quality, or sandy soil, or soil that doesn’t accept water – then I hope you made them extra tall. Since you are likely buying soil that will drain well for the raised bed portion, if you live in a particularly dry area, or at a higher elevation – then you may be fighting drought all the time. The raised beds will get hotter than the surrounding ground, and the water will drain well – this is a recipe for dry, dead plants. But in addition to that, if your base soil doesn’t have much organic matter, and is fairly compacted – your veggies will need substantial amendments every year because their roots will be much shorter that normal in-ground gardens. Alternatively it just takes some elbow grease and a bit of gumption to begin transforming your soil. Like I stated in the beginning – if you are in-love with the idea and aesthetics of raised bed gardens, then by all means go forth and do it. But my goal is to get you thinking into some items that aren’t always considered when people put them in. Just think about raised beds in detail, and make sure you are happy with the layout! But if you think I’m totally off base and wrong – tell me in the comments. If you had raised beds and had bad experiences, tell me about them and I can update this post. Did I miss anything, let me know! Very informative! You covered a few bases I had not considered and certainly make total sense. I love your articles. Thank you so much for the feedback & taking the time to read our content! Comment Well done article. Thanks for doing this. It certainly opened my eyes to viable alternatives. Thank you so much for taking the time to give us feedback, Robert! We felt the gardening world is really inundated with everything related to raised beds these days & felt we wanted to share an alternative viewpoint for people to consider. Thanks again! Hope you find some other useful information on our page, as well! How would you grow a garden if your yard is only 1 foot deep and then you hit bed rock. That is what i have. In your situation, I would do raised beds or container gardening. It is better to have a garden than not. And I don’t think I would want to go rent a jack hammer…..
We have a strip of ground that is mostly rock running just beneath our yard. It cuts through part of our vegetable garden. I’ve removed most of it inside the garden, but it wasn’t solid. Just 90% rock. Good points which need to be seriously weighed when discussing raised beds. There is one positive to consider which is seldom touched on. For regions where winters are brutal and spring often short, raised beds thaw, drain and warm up sooner than in-ground beds. Even a relatively small extension of the growing season can be the difference between a good and a great crop. That is a good point on short growing seasons. You have to adapt to your situation. I think that would be particularly important for peppers with long times until harvest like habaneros. Finally a common sense yardie, Another tip if you have to use raised beds go bush use logs, cost nothing, hold moisture beautifully bring beneficial bugs & fungi & as they break down they create beautiful rich soil chemical free. We have done this over our 5acre clay property & now have about 2ft & more of fantastic soil covering the land, I can basically plant anything anywhere I want. Chooks near by help control the house eating bugs. Excellent tip. 2′ of beautiful black soil is everyone’s dream. It takes time, but is completely worth it. Commented filled our beds with composted hay from our pasture and our own dirt. Just a top layer of bought soil. Now that is a nice, cheap way to do it. And the fertility will be as good or better than anything you can buy. There is a way to have raised beds without the cost of boards. I just make my raised beds by making walking paths between each by shoveling the soil from the path up onto the bed area. I make my paths about 3 shovel widths wide; shoveling half the dirt to the left bed and the other half to the right. When I first started the beds were only about 6 inches high because of the poor soil quality, but each year I add as much organic matter as I can find/afford. Now some are 12″ high. The edges do taper a bit. I often plant lettuce on the edges. To help with keeping weeds down I line the paths with old carpet remnants. In the fall, to improve the soil in the beds and make it easier to start planting earlier, I put down a layer of newspaper, manure, and mulch of some kind totaling about 4-6″ deep. During growing season I also use a lot of mulch to keep the weeds down. Having the raised beds really helps with water drainage and since I live in an area with a very short growing season, it helps to heat the soil. It may not be a “pretty” as the Pinterest beds mentioned above, but they work quite well for me. It sounds like you have found a very practical solution to your situation. I like the idea of using old carpet to keep the weeds down. It sounds like you have found a good way to make raised beds for almost no money, and mainly focusing on vegetable yield – nice!